The need for real conversation about the future of "organized learning" has never been greater. In the United States, in Australia, in the United Kingdom, in Ireland, Canada, and elsewhere we have two forces battling over education. We hear constantly from the first group, which includes some of the wealthiest and most powerful people on earth and the biggest corporations - Oprah Winfrey, Arne Duncan, Bill Gates, Eli Broad, General Electric, many Ivy Leaguers, and a bunch of ultra-rich hedge fund managers. This group has proclaimed themselves the saviors of our schools, and with their vast resources, they have squeezed all dissenting views out of the national media. But there is another group, and another narrative. This narrative arises from people with more experience in education than Michelle Rhee's two years in Baltimore or being handed a job without qualifications by Richard Daley, Mike Bloomberg, or even Barack Obama. This is a student-centered narrative of systemic change. It is a narrative which understands the fundamental issues facing our students. A narrative which understands, in the words of the Sacramento (CA) schools, that "there is no magic bullet to our problems, no easy answers. But collectively and collaboratively, I believe we have enough power to change the lives of the children we serve." We can't get NBC or Oprah or The New York Times or even Barack Obama to pay attention yet, but we can start the conversation from below. 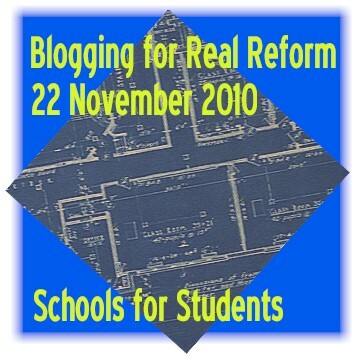 I'm asking you, those who know schools, and who seek real reform, to blog with me and others on Monday, November 22, 2010. Describe the change you think education needs - in America, in the UK, in Australia, in Ireland, in Canada, wherever. The date is "American" - it is designed to push the conversation as those in the US gather with their families for Thanksgiving, but the idea is globally important. "Let’s make sure our voices are heard on and after November 22. [says Dr. Pamela Moran]. The American Association of School Administrators and the Virginia ASCD both have taken a public stand to say, “let’s continue this call to action in the social media world” by supporting the November 22 date on their websites. Paula White, @paulawhite, of the cooperative catalyst graciously has set up a site for archiving links. "Our links from November 22 need to make a sound beyond our “forest.” Let’s not just write, but also share work with local media, national media, politicians everywhere, the Secretary of Education and the President of the United States. Our educational associations, many of whom have a social media presence today, need to hear us. We know the names, the emails, the twitter addresses, and blogs of those who need to hear educators’ voices. We just need to share." If you add a link to your post in the comments section of the "Blogging for Real Reform" post which will appear here on November 21, I will link to it - whether we agree or not - no matter what you say - short of hate speech. And then I'll ask you send your blog post, and a link back to the collection, to as many of your local news sources, and local leaders, as you can.